Wow really, really nice fellas! Cant wait for the two week mark.... looking forward to seeing this in action. Just wondering though, will you show us screenshots or a live feed of some alpha gameplay (like Shadowrun guys did). Cool. They are fun to watch but I'm surprised really there's so much interest in it. Lets plays actually seem quite popular on youtube, I guess people are interested in seeing how other people play and how the experience differs to their own? I sometimes watch lets plays to see how other people do stuff, but my main use of lets plays is a way to preview and review a game. Screw big news site reviews, watching someone else play the game is a million times better. Yeah, that's why I usually watch Let's Play's, too. I don't often watch entire Let's Plays's ... I'll jump/skip around the first couple, to get an idea of interface/gameplay without spoiling myself too much. I find that a lot more helpful than written descriptions. But occasionally a LP-er is very entertaining/funny, if you're familiar with the game already, and then I'll watch for the comedy hilarity/the LP's charisma...but that's not often. We're going to show the exterior environment running in game, but gameplay may be limited/absent. We're not as far along in our development cycle as the Shadowrun (or Wasteland 2) teams. All the same, the waterfall area is already impressive as a still so it's going to be great seeing it in motion. Edited by Serrano, 01 April 2013 - 10:41 AM. Can't wait to see more of the environmental artwork, and to see them in motion! I'm very pleased that the art team seems to have embraced a full color palette, rather than the drab monochromatic games that embrace brown and grey in an attempt to look 'realistic'. It was one of the things I loved about the Witcher 2, and Baldur's Gate 2 for that matter. In any case, this looks great, and I can't wait to see the next update! How come there's only four members at the bridge?? Its supposed to be six membered party based...... or did the two guys fell off the bridge while making the jump cause the got a lower number in their dice rolls??? I mean does this kind of things can happen at the game... or is just a drawing thats it?? If this screenshot is from early in the game, you may not have access to more than 4 party members yet. Ehh... this can't be a serious post. 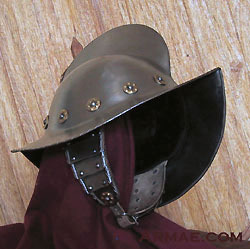 morion helmets are also welcome ! And there was much rejoicing... "Yayyyyyyyy..."